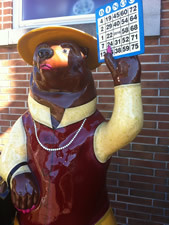 Ladies Auxiliary of Boyertown’s Friendship Hook and Ladder Fire Company will celebrate their 50th Anniversary and recently added a standing Lady Bear to the Bear Fever community arts project. 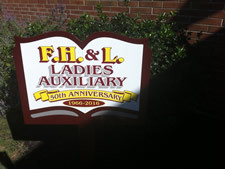 The Ladies Auxiliary of Boyertown’s Friendship Hook and Ladder Company, comprised of over 250 members, has hosted Bingo games every week at the fire company for over 50 years to help fund projects and equipment for the “Hookies” fire company, fire police, the junior fireman program, as well as community organizations including Multi-Service, the Salvation Army, ambulance companies, and the Red Cross. In addition, the group has contributed funds toward refurbishing the community’s Christmas lights and several playgrounds and looks to assist the company in replacing the 20-year-old dishwasher. Each week the group awards prizes to Bingo winners purchased at Brooks Meat Market. Prizes include grocery items and staples such as items such as paper towels. To celebrate their 50th anniversary, the group will unveil their own Bear Fever bear created by artist Jeff Graber of Graber Letterin’, and features the company’s colors: maroon and gold. The group began in 1964 as part of Boyertown’s Centennial celebration. The group meets monthly; there are @ 30-40 active members—male and female—who participate in gatherings throughout the year: an annual picnic, birthday celebration, an anniversary banquet in October, a Christmas banquet, and occasional bus trips. Forty-two people attended the 2012 picnic, according to charter member Mary Stetler.